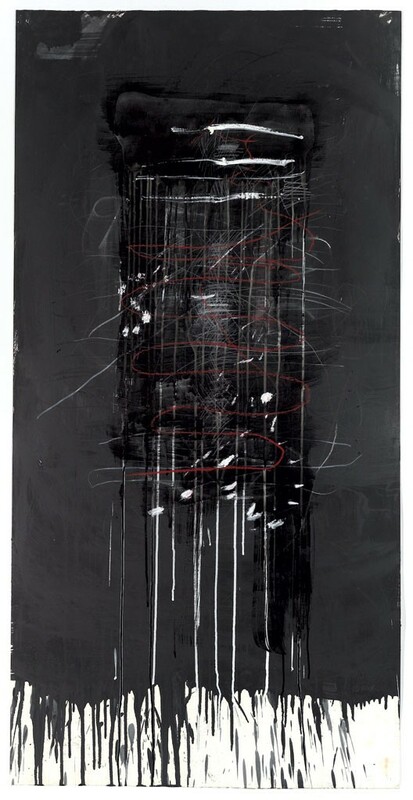 Pat Steir's abstract paintings appear to involve as much physical dexterity as artistic sensibility. At age 76, this acclaimed descendant of the mid-20th-century avant-garde remains endowed with both attributes, as demonstrated in a video accompanying Steir's current show at the Helen Day Art Center. The Manhattan-based artist, who also works at a studio in Stowe, is shown lugging buckets of paint up ladders, dumping their contents onto king-size canvases and wielding her brush like a fly whisk as she randomly flicks inks, oils and acrylics. Steir fires a squirt gun loaded with paint at one of her pieces and tosses glitter onto another. "I try not to think when I work," she tells Stowe video maker Molly Davies. "The paint does what it does, depending on circumstances." And the paint does some beautiful things in the processes that Davies documents. One work featured in the video could be a portrait of the Milky Way. White flecks that Steir produced by flinging paint at an expansive surface sparkle against a deep, dark background. It's a haunting starscape. Viewers also see Steir creating what might be a recent addition to the "Waterfall" series that brought her fame in the 1980s. Streaks of green and aqua cascade and intermingle as the black-clad artist pours paint from the top edge of a tall canvas, letting gravity do what gravity does. Steir's method was inspired by the "indeterminacy" approach pioneered by composer John Cage (1912-1992), whom she met in 1980. Cage let the dance of chance give shape to many of his works, with the artist serving more as an instigator than an intervener. Steir's style also owes something to the automatic painting technique used by surrealist artists in the 1920s and '30s. About half of the pieces on display at Helen Day reflect her let-it-be practice in its most hands-off form. One result is a set of black blobs on white paper tacked on the white walls of the art center's main gallery. A suite of 14 such pieces, arranged in a horizontal row, includes a few inky outbursts that may remind viewers of Rorschach tests — except that these shapeless coagulations won't conjure up associations with much of anything. A few intriguing forms and an occasional blast of brightness appear amid the darkness of works created over the past 10 years and assembled here. But this array may disappoint visitors whom the video has primed to expect visual wizardry. The mood lightens and the tempo quickens in Helen Day's East Gallery, which presents some of Steir's paintings made between 2004 and 2008. In addition to using a richer range of hues, these generally smaller-scale pieces have a more refined appearance. That's partly because their simple white frames make them seem kempt in comparison with the tacked-to-the-wall display in the main room. Steir also worked with a subtler hand in the pieces made in the past decade. A few black blobs are included, but the artist composed most of these paintings with a lighter touch. Large portions of some surfaces remain unworked, and Steir's sinewy forms are given room to breathe. Grace and harmony emerge in paintings that reflect the figurative use of a scalpel rather than a sledgehammer. Steir's debt to Jackson Pollock is particularly obvious in one of these pieces, which may also be the most beautiful item in the show. Black, brown and purple paints are dripped, swirled and spattered on a vertically oriented canvas with enough negative space to make the colors writhe and swerve. Scenes of Steir at work in Davies' video may remind viewers of an iconic photograph of Pollock: Cigarette wedged between his lips, the abstract expressionist squats beside a canvas on the floor, paint dripping from a brush he's dipped into a can that he holds in his other hand. A couple of pieces in the Helen Day show demonstrate similar outcomes from this freewheeling method of painting. A third phase of Steir's career is represented by a single work hanging above the art center's front desk. It's from 1977, when the artist was a minimalist — not the maximalist she seems to have become. This piece, titled "Drum Series," consists of eight sheets of colored paper, each containing two images, neatly grouped inside a frame. Most of the sheets bear black pencil marks arranged in rows. A few include readily recognizable symbols — the letters of the alphabet, for example. The influence of the outstanding American minimalist Agnes Martin (1912-2004) — a friend of Steir's — is unmistakable in "Drum Series." This is the only work in the show that has been given a title. The others' lack thereof compels viewers to focus on the paintings without recourse to clues to their "meaning." Curator Rachel Moore has picked up on this cue to let the art speak for itself. She omits the explanatory background notes and wall labels that can make museums and galleries resemble libraries. Moore shows that less can be more in curating as well as in painting. The original print version of this article was headlined "Beyond the Brush"